This kind of data can really give you a sense of which players are the most involved in plays that lead to chances being created. The most important of these passes isn’t always the same. Sometimes it’s the Secondary Shot Assist getting the player who makes the Key Pass into space. Sometimes nothing can develop without the vision of the player who made the Establishing Pass & often it’s simply the ability of the player making the Key Pass to get the ball to a player in an advantageous position to get a shot off. Of course, not all shots are created equal & that’s why we’ll also look at Expected Assists & xG Chain….but first here are the early leaders for each Shot Creation Pass category. Normally these stats will be presented as a per 90 minutes average but given how early it is in the season we’ll rely on the raw totals. Laying the ball off to a teammate outside the box who launches a hopeful shot from 35 yards out isn’t as nuanced a skill as the player who can consistently find a teammate in a dangerous scoring area in the box. There are all kinds of passes that can do this…maybe it’s a through ball which plays the shooter into space or maybe it’s the ability to cut a ball back into a central area after gaining territory on a run up the flank. Sometimes it’s a forward knocking the ball down to a teammate & sometimes it’s the traditional cross into the box. Thankfully, with Expected Goals we can place a value on the pass that sets up a shot, regardless of whether it leads to an actual goal or not. Take this shocking miss from Kris Boyd from a friendly against Sacramento a couple of summers ago. 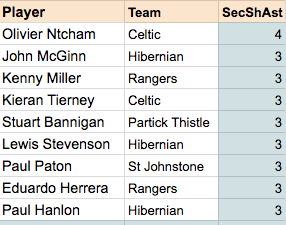 Kenny Miller didn’t register an assist, but is that his fault? Shouldn’t he still get credit for creating such a clear cut goal scoring opportunity? Now, two weeks of data really isn’t going to be a reliable measure of which players are the most visionary & effective passers – but as the season goes on this will be a very useful tool to measure a player’s value beyond just his actual assist totals. Chris Cadden….we speak your name. His 1.92 Expected Assists means that his five Key Passes have led to 44% of Motherwell’s total Expected Goals after two matches (4.40). He has zero actual assists on the season. Is that his fault? But, I have learned first hand that it can lead to some real insight for the analysis of how players impact a team. Last season, I played around with xG Chain for the club I was consulting & two players stuck out for different reasons. One was a center back who had not been in the starting lineup for a few weeks, but I discovered that his xG Chain stats were among the best on the team. He was consistently pushing up & getting involved in the build-up play that ultimately led to quality shots. Guess who was back in the lineup for the next match? 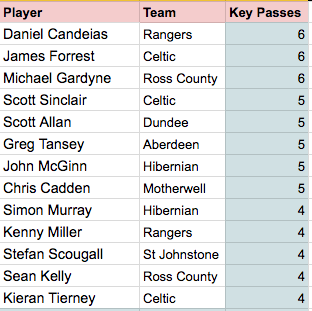 Another player led the team in Key Passes & Expected Assists but actually ranked surprisingly low in xG Chain. 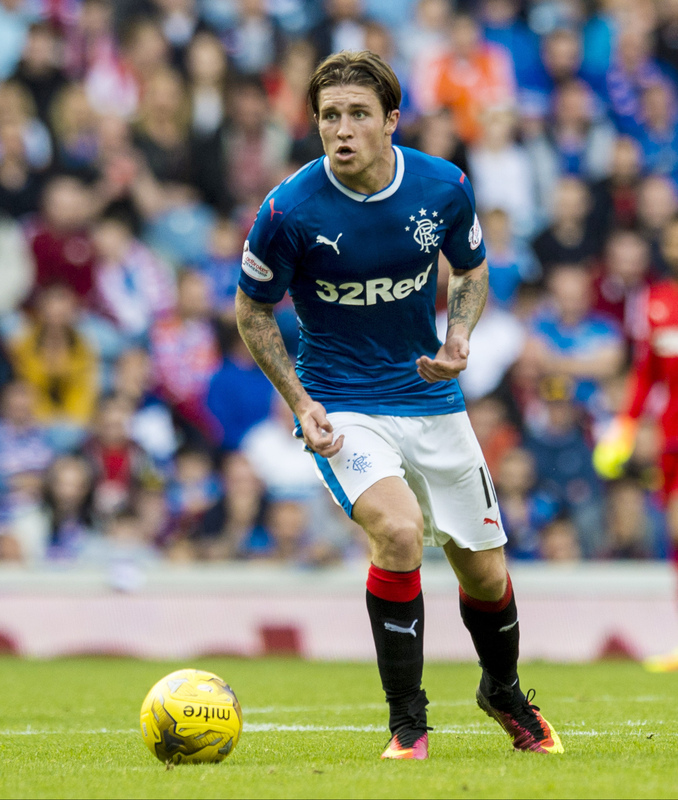 He had a killer final ball but wasn’t as involved in other aspects of the build-up play. This became an entry point for the coaching staff to brainstorm ideas to get this talented player more involved in other ways for the team’s attack. It should be noted that I only count xG Chain for those three passes leading up to shots (largely out of self-preservation) & that the Lawrence/Knutson model includes each & every pass leading up to shots. Here are the xG Chain leaders after two weeks of the season. 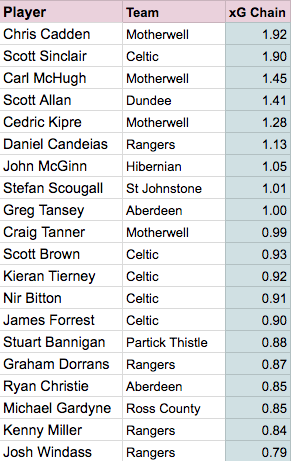 Notice Chris Cadden’s total is the same as his Expected Assists total. He has no other Shot Creation pass this season beyond his Key Passes. 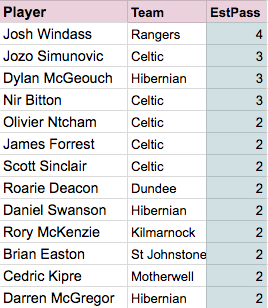 That will change but also may highlight an over reliance on Cadden for the final ball. Also, take a player like Graham Dorrans. 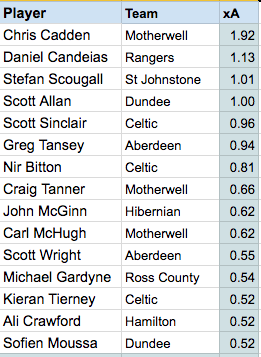 He only has 0.11 Expected Assists this season, but has the second highest xG Chain for Rangers. His build up play has led to other players getting the opportunity to make the key pass that leads to a shot.